Research Area : Manufacturing Technology with focus on Metal forming, Metal Casting & Machining. Various institutions in Bangalore (1989-1992). Adhiyamaan College of Engineering, Hosur (1992-1995). Lecturer to Professor and Head of the Department of Mechanical Engineering in St.Peter’s Engineering College, Chennai (1995- 2007). 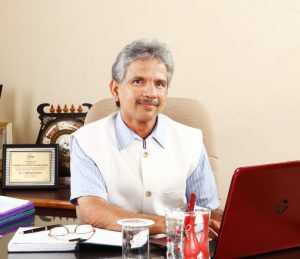 Principal of SMK Fomra Institute of Technology, Chennai. (2007-2010). Visiting faculty , Department of Mechanical Engineering, College of Engineering,Guindy,Anna University (2010). Director Academic in St.Peter’s University from January 2011. Member of various professional bodies. Secretary of Indian Institute of Production Engineers, Tamil Nadu Centre. Chief Executive Officer, St.Peter’s Engineering College-Technology Business Incubator. Associated with Bharata Natyam for the past 45 years. Performing Nrithya Nivedana in two temples for 20 years.